Click-lock laminate vs vinyl planks flooring – comparison chart. Laminate flooring often is an imitation of real wood or stone tile. Vinyl flooring planks are normally manufactured similar to look of wood, cork, or tile. Suitable for most rooms in the house including kitchen, bedrooms, living rooms, or hallways. Not the best solution for bathrooms. Most of laminate floors can be installed in combination with radiant floors heating system. Vinyl flooring can be installed in any room with no exceptions. Plastic surface of laminate flooring is quite slippery and can be scratched by sharp objects. Water spills can get to the core layer and damage the floor. Vinyl flooring is elastic materials and less susceptible to scratches than plastic laminate and it feels softer under the feet. Pet’s claws normally won’t scratch the laminate floors surface as easily as real wood floors. But laminate flooring could be damaged by pet urine. Vinyl flooring is a great option for homeowners who have pets. 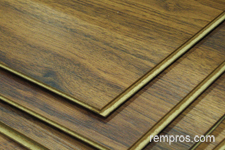 High quality laminate flooring is extremely resistant to stain. Depends on a product. Quality vinyl flooring is a stain resistant material. Laminate flooring is a water resistant material, but its core layer which often made from MDF can be easily damaged by water. Vinyl flooring has a superior resistance to water and some products are 100% waterproof. 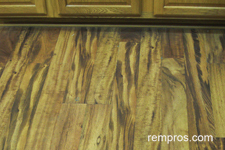 Quality laminate flooring does not change color under light exposure. Direct sunlight do not discolor vinyl planks floor. Laminate flooring rated AC4 or AC5 is extremely durable and hard enough to withstand heavy traffic in commercial buildings. Some vinyl flooring designed for heavy traffic while others should be used for light traffic residential applications. Floating laminate flooring typically do not lower transmission of sound significantly and have low thermal insulation properties. Poor sound and thermal insulation abilities. Lifespan of click-lock laminate floors normally vary from 15 to 20 years. Life expectancy of floating vinyl flooring is about 25 years. Vinyl is easy to clean and maintain type of flooring. Greatly vary. Some laminate flooring producers offer limited lifetime warranty on high quality products. Typically vary from 20 years to limited lifetime warranty. Floating vinyl flooring planks weight approximately 2 - 2.3 pounds per square foot. 7 millimeters, 8 mm, 10 mm, 12 mm. Thickness of vinyl planks normally vary from 3 mm to 5 mm. Vary, but laminate click-lock flooring is one of the most affordable flooring materials on the market. Greatly vary. Normally cheaper compare to real wood, but could be slightly more expensive than laminate. Cost to install floating laminate floors very similar to laying vinyl planks flooring. Nearly the same as laminate. Many homeowners are able to perform vinyl floors installation as do it yourself project. Installation of 7.5” x 48” laminate flooring planks in 10’x 12’ bedroom is normally a few hours task excluding removal old flooring material and preparation work. Experienced installer typically is able to complete installation of 6 in. x 36 in. vinyl flooring planks in 14’ x 18’ living room in one day, not accounting any preparation or extra work. Can be scratched by heavy furniture or sharp objects and laminate floors cannot be refinished. Core layer can be damaged by water. If the subfloor is not flat, it should be fixed prior to laminate planks installation. Laminate floors shouldn’t be installed tight to walls or other permanent objects in the room such as kitchen cabinets or build-in furniture. Not flat subfloor will cause a significant reduction in lifespan of floating vinyl planks. Deep dents and scratches on vinyl floors often hard to fix. Click-lock laminate and floating vinyl planks are great low cost flooring options. They are both very easy to install and do not require much of a maintenance. High quality laminate looks very like real wood what makes it very desirable flooring material for many homeowners. Vinyl flooring has an excellent resistance to moisture and it is one of the best low budget materials for bathroom or kitchen floors.